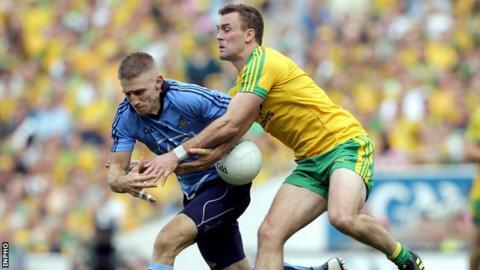 Eamon McGee says Donegal headed into last month's All-Ireland Football semi-final against Dublin knowing that they were going to shock Jim Gavin's side. The Dubs were huge odds-on favourites to beat Jim McGuinness's side but lost 3-14 to 0-17. "Jim [McGuinness] had them down to a tee - where they were weak and where they were strong," said McGee. "That gave us a massive amount of belief and coming out of that, we knew we were going to win." McGuinness delivered his dossier on Dublin during the squad's five-day get-together prior to the semi-final. "We were away for a few days and we sat down an analysed the Dubs and how we were going to go about approaching the game," added McGee. Since his team's shock semi-final win, McGuinness has been working on another master plan to see off the Kingdom in Sunday's decider. One of the tactical decisions which McGuinness will have to make is who he will deploy to shackle in-form towering Kerry full-forward Kieran Donaghy. Eamon McGee undertook that role in impressive fashion in the 2012 All-Ireland quarter-final but his brother Neil could be another contender for the key task. "Whoever picks him up, be it me, Neil or Frank McGlynn or whoever, it's going to be a big, big challenge and we'll certainly need to be at the top of our game. "Jim indentifies the few men every day and it's an important part of the battle to shut down those quality forwards. "In the semi-final against Dublin, you had Bernard Brogan, Eoghan O'Gara, Paddy Andrews, Diarmuid Connolly and a load of others and it was a case of putting fires out all over the place. "But whatever job Jim tells you to do, you'll be more than happy to do it."